Click on a golf course or lodging property on the right sidebar and it will show you where it is on the map- including a picture, name of course/property, address, directions and link for more information on our site where you can also book your golf trip. For a truly unique view - be sure to click satellite orhybrid for a real bird's eye view! Remember you can also drag the map to move it and zoom in!Have fun! Know where you want to go? Scroll below the map to start creating your own customized golf vacation! 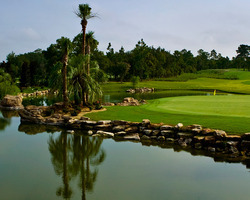 The Lake Jovita Golf Club championship courses are acclaimed as tour quality. The 263-acre North course is every essence of the worthy compliment. A little more contemporary in style, the North course has even greater elevation changes than the South; providing golfers with positively incredible views of the scenic community. The North Course continues the tradition of the South Course in terms of elevation changes that are contrary to most Florida courses. In fact, from the second tee box, players have a panoramic view of the Florida countryside - five or six miles to the northeast. Playing from a length of 7,226 yards from the back tees, the north course also features three other sets of tees to create the right challenge for players of all levels. Amenities include a world-class practice facility, complete putting green, chipping green and separate teaching tees. Lake Jovita's South Course is rolling hills, undulating valleys and ancient hardwood forests dotted with freshwater lakes. The landscape and elevation changes here are far more typical of North Carolina than they are of Florida. But, make no mistake, this is Florida golf at its finest, thanks to the creative design work by the architect team of Tom Lehman and Kurt Sandness. 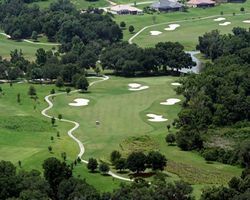 You'll be interested to know that the Lake Jovita South Golf Course features one of the longest natural elevation drops of any golf course in the state - 94 feet from tee to green on the Par-5 11th hole. Playing from a length of 7,126 yards from the tips, the South Course also features three other teeing areas for golfers of all skill levels. In a state with over 2,000 golf courses, Juliette Falls Golf Club ranks among the very finest. Juliette Falls is a par 72, championship course that soars beyond every expectation of luxury. The 7,200 yard course is a rolling parkland terrain design highlighted by four spectacular waterfalls and significant elevation changes. Fairways are lush and lined by large oaks, pine and palmetto forests, framed by acres of crushed white coquina shell that serve as waste areas. Natural areas are preserved where abundant native plants and colorful wildflowers add to the beauty of this higly-rated course. With five sets of tees, golf at Juliette Falls will be home to all levels of players regardless of skill and expertise. Arrive early to utilize our 10 acre practice complex with north and south tees, chipping and putting areas.